Race Rock Lighthouse was built in 1871 on land that was already rumored to be haunted by seamen and passengers of the many ships have gone down there and drowning victims of the nearby twin currents. The first keeper Neil Martin died here as well. Witnesses have reported ghostly whispers, laughter, yells, footsteps, and voices that call their name, as well as being touched, poked or pushed by an unseen hand. Wet footprints have been seen coming out of the shower area, which has not had running water for years. 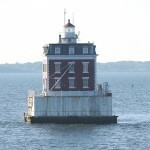 (The lighthouse was automated in 1978, eliminating the need for a live-in keeper.) Nonetheless, the shadowy figure of a man has been seen in the tower by people passing by. I grew up going to a house on Fishers Island in the summer. It was absoloutly 100% haunted. Id have to look up the address but, i dont want this message to just fall on deaf ears so please contact me if youd like to know more… The address, experiences, history of it etc. Thank you. Hi Erika! 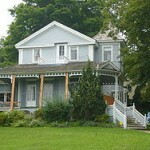 I am very interested in hearing your experiences, I am in the area for the summer and am looking to investigate areas with strong paranormal activity. Please email me at s.mosey2@gmail.com so we can discuss this further. Thank you so much!